Evening Activity in all the hotels (see below). Salwa Hdeib greets the participants on their arrival to Jerusalem. Gila Svirsky welcomes the delegations. 11:30 – 13:30 Panel: In Memory of Hagar Roublev - Feminist Perspectives on the Palestinian – Israeli Conflict Chaired by Luisa Morgantini. 15:00 – 17:30 Workshops related to the Palestinian-Israeli conflict, each moderated by a Palestinian and an Israeli. The politics of the Judaisation of Jerusalem. Aida Shibli (Palestinian citizen of Israel), Zahra Khalidi (Palestine). Jerusalem - Strategies of resistance and solutions. Dima Nashashibi (Palestine) Lily Traubmann (Israel). The Apartheid Wall: Politics, effects and ways of resistance. Fadwa Khader (Palestine), Molly Malekar (Israel). Settlements and the politics of colonization and transfer. Anat Rosenwaks (Israel). Boycott, divestment, and sanctions against Israel. Debby Lerman (Israel). Anti-occupation women political prisoners. Hava Keller, Sara Lahiani (mother of Tali Fahima) (Israel), Mariam Irbash (Palestine). Occupation, women and health. Dr. Mai Kaileh (Palestine), Dr Ruhama Marton (Israel). Occupation, women and education. 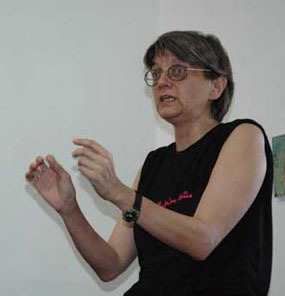 Nurit Hajaj (Israel, in Hebrew), Itidal al-Ashhab (Palestine – in Arabic). Occupation, women and poverty. Rawan Natsheh (Palestine), Nina Mizrahi (Israel, in Hebrew). Occupation, women and violence. Haya Sarsour, (Palestinian citizen of Israel), Hilla Kerner-Sulieman (Israel) in cooperation with the World March of Women. Militarism, occupation and resistance. Ruth Hiller & Hanna Aviram (Israel), Samia Bamieh (Palestine). 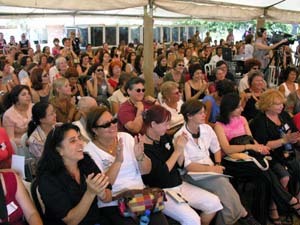 Challenges, obstacles and alternatives for Israeli and Palestinian women's joint peace activities. Huda Imam (Palestine), Rauda Morcos (Palestinian citizen of Israel), Yvonne Deutsch (Israel). The day after the disengagement. Nina Mayorek (Israel), Amal Khreisheh (Palestine). Conflict and women's daily survival strategies. Haya Shalom, (Israel), Samar Dissi (Palestine). Open Forum: Sharing experiences (Pnina Firestone (Israel), Nadia Harhash (Palestine). Presenting the International Women's Commission. Hania Bitar (Palestine), Naomi Chazan (Israel), Antigoni Dimitriadou (Greece). 9:00 – 11:00 Panel: Women's Global Challenges, chaired by Charity Angya (Nigeria), Yolanda de la Luz Aguilar Urizar (Guatemala), Dalit Baum (Israel), Stasa Zajovic (Belgrade). 1. War crimes against women.Yolanda de la Luz Aguilar Urizar (Guatemala). 2. International law- a tool for struggling for women's rights. 3. Patriarchy. Mary L. Wentworth (US). 4. Grassroots resistance to neo-liberal politics. Julieta Ojeda (Bolivia). 5. UN resolution 1325: how to utilize it for women's benefit. Antigoni Dimitriadou (Greece), Ilana Aflalo Peretz (Israel), Salwa Hdeib (Palestine). 7. Women and Development: Deborah Brous (Israel). 8. Women reading: poetry, literature and resistance. Elana Dykewomon (US), Jana Zvibleman (US). 9. Massacres of women. (feminicidio) Maria Jose de la Rosa Ignacio (Madrid). 10. Open forum – women's resisting experiences and perspectives. Natasha Khalidi (Palestine), Nava Elyashar (Israel). 11. Women in conflict resolution. Gili Pliskin (Israel), Mechtild Eisfeld (Germany) Zahra Khalidi (Palestine). 12. Conditions for successful reconciliation. Liliana Mason (Chile), Huda Imam (Palestine). 13. Round table: gender relations during political conflicts and in their aftermath. Simona Sharoni (USA), Dinora Aguiñada (El Salvador). 14. Women's activism in Conflict and Post-conflict areas, and the politics of assistance. Jadranka Milicevic (Sarajevo/Bosnia), Jelena Djordjevic (Belgrado/londres), Svetlana Saric (Vlasotinc, Serbia), Stasa Zajovic (Belgrade/Serbia), Zorica Trifunovic (Belgrade/Serbia). 15. Women, Health and Domestic Violence. EPIC Project: Franca Balsami (Italy), Bilha Golan (Israel), Dr. Salwa Najjab (Palestine). 16. Effects of globalization and privatization on women, Julia Scherf (HBF), Eleanor Jose (Phillipines). 17. State terrorism and how to struggle against it. 18. WIB challenges and prospects. Jeni Allenby (Australia). 19. Politics of Fear, Hatred and Racism. 15:00 – 18:00 Panel: Linking local with international issues – future plans and strategies for struggle. Elisabetta Donini (Italy), Rela Mazali (Israel). Evening Activities in all the hotels (see below). Morning: Internationals meet in Ramallah with Palestinian women activists. Afternoon: Internationals and Palestinians demonstrate in Bil’in. Israelis have a tour of the settlements in the Old City of Jerusalem. Morning: Mega vigil at Kalandia checkpoint. Afternoon: Closing ceremony – plenary. 20:15: Conference Opening Show: The Palestinian singer Reem Telhami. 21:00: Party. D.J. Sylvia L. World Music. 21:00 Open mic. : Women singing, music, story telling…. 21:10: Film “The Women Next Door”. (English Subtitles). 20:15: Film “Arna’s Children”. Producer Osnat Trabelsi and Director Juliano Mer-Hamis will be present. 20:30: Movement led by Michal Pundak-Sagi. 20:30: Women relaxing and meeting over a glass of wine. Please bring musical instruments. 20:30: Party. D.J. Hadas, 30’s to 70’s. 20:30: Drag Kings Show: Slim Shuky, Shlomy Artza, Semi Sababa, Gurnish Nice-f, Roberto Fetochiny. 20:15: Film. “Route 181” Directed by Michel Khleifi and Eyal Sivan. Conversations with Jews and Palestinians along the Green Line. 20:15: Raging Grannies – subversive music (English). 20:30: D.J. Little_Y. Women’s music party: hip-hop, reggae etc. 20:30: “Profile 21” Saxophone, piano and singing. Shir Katz and Yasmeen Wagner.